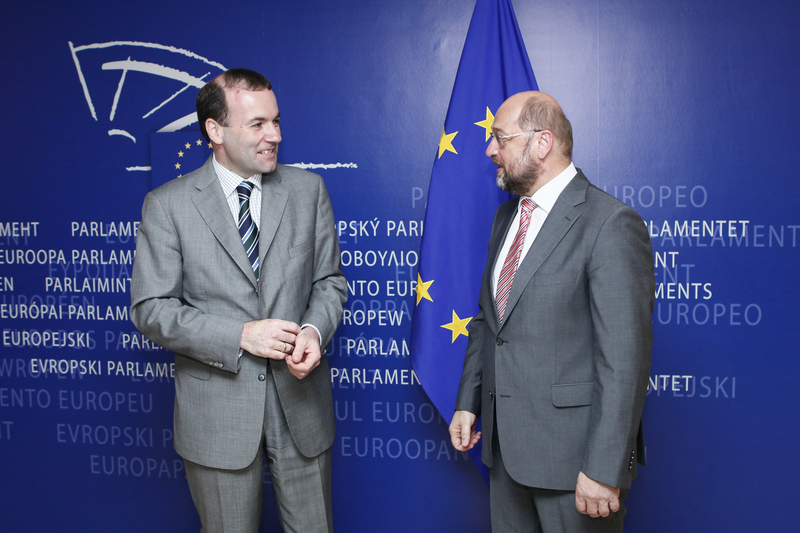 “[W]e had early discussions on finding a common ground for a majority to implement reforms for growth and jobs, and to make sure that the EU is equipped to meet the challenges ahead,” said Manfred Weber, the chairman of the centre-right ?EPP group in the European Parliament. The European People’s Party (EPP) and Socialists and Democrats (S&D) are the two biggest groups in Parliament. A so-called grand coalition between the two was predicted by analysts before and after the elections. The centre-right political family has pushed five priorities, outlined by its leading candidate in the EU elections, Jean-Claude Juncker. These include: a digital single market; a European energy union; a successful trade agreement with the US (TTIP); a reform of the monetary union; and an answer to the UK’s concerns on EU membership. Last week, the outgoing president of the socialist S&D group, Hannes Swoboda, listed the conditions for Juncker to win backing from the socialists. These include more flexibility for the EU’s fiscal policies (the so-called Growth and Stability Pact) and a reform of Europe’s migration policy. The EPP has a total of 221 seats in Parliament, the S&D 191. Together, they hold 412 seats, which gives them a 36 seats margin for a majority in Parliament. The European Parliament usually forms ad hoc alliances according to the bills being passed. But leaders from both major groups are convinced the grand coalition will be stable across different policy areas, presuming an agreement is reached on a? number of key points. The deal being reached between these parliamentary factions will most likely include the support for Jean-Claude Juncker as EU Commission president. Juncker campaigned as centre-right frontrunner (or Spitzenkandidat) across Europe for the EU elections, in an initiative initially put forwards by the mainstream parties in the EU Parliament. The two main factions will continue their discussions in the first plenary session of the new European Parliament, next week in Strasbourg. The meeting in Parliament followed a strategic document, leaked by European Council members to EURACTIV and other media, which presented the EU heads of state and government’s view on the challenges ahead. On Thursday and Friday (26-27 June), EU leaders will discuss an agreement on the EU priorities as well as who will implement these as president of the EU Commission. ?Juncker has secured the support of a number of heads of state in the past days and weeks, including nine socialist EU leaders. Juncker’s camp is cautiously looking past this week’s EU Summit. Once nominated, the Luxembourger will have to finish the work of Weber and Schulz to secure a majority in Parliament. Talks will be held in Strasbourg at the first plenary session and in the days before the second session on 14-17 July. “I expect to find that these strategic priorities are broadly similar […] You don’t need to be a scientist to find out [these priorities],” a source close to Juncker told EURACTIV. “The role is to set the strategic priorities, the strategic orientation of the next Commission. This has nothing to do with the working programme [which is more concrete]. These priorities are very important [because] they give an indication on what is feasible,” the source said, stressing that this doesn’t bar Juncker to take the lead on more specific policy issues. “We’re negotiating with all parties, except for the far-right with whom Mr Juncker will not speak. Everyone enters these negotiations with requests. Of course, not all requests will be met,” the source added. In a commentary published on Monday (23 June), Jacques Delors and António Vitorino of the Notre Europe think tank in Paris stipulated three priorities for the upcoming five years: stronger support for growth programmes, reinvesting in economic relations with neighbouring regions and a clearer picture of EU policy initiatives for its citizens. An agreement on the challenges “would be all the more useful if it led to the adoption of an inter-institutional agreement formalising a ‘contract for the parliamentary term’,” Delors and Vitorino wrote. After the EU elections, the liberal ALDE group hoped to take on the role of ‘kingmaker’ in the next EU Parliament. Over the past five years, the faction has granted support to either the left or the right, often ending up in the winning coalition. But, “the S&D and EPP stressed that they are very well on their way to secure a majority”, leaving little room for ALDE to get their foot in the door, ALDE spokesperson Neil Corlett told EURACTIV. Still, Corlett stressed, “the seat count of the S&D and EPP combined is only a narrow majority and I believe they will need support”. With the support of the liberals, legislation could be passed fairly easily in the upcoming years. The liberals also fell from third to fourth position in the Parliament, as the Conservative ECR faction scooped up many of the new member parties to join them. The ECR enters the Parliament with 70 seats; ALDE ended up with 67 seats. The deadline for forming political groups passed on Tuesday. Following the European Parliament elections, 2014 will bring about change in many of the top positions in the European Union. Traditionally, EU top jobs are the result of a hard bargaining process between the member states. Who will take centre stage on the European level is negotiated on the basis of nationality and political allegiance, and is due to reflect a fair representation of European member states and of the political power balance in Europe. >> Read our LinksDossier: EU top jobs: Who's next? The challenges ahead for these future EU leaders are considerable. Structural reforms are needed for the EU's economic and monetary union; (youth) unemployment levels are staggering and the issue of UK membership has gained a sense of urgency. >> Read our LinksDossier: The next European Commission: What challenges? European leaders were confronted with a great distrust in the EU institutions. The number of eurosceptic politicians-elect surged in the elections on 22-25 May while overall turnout remained low.